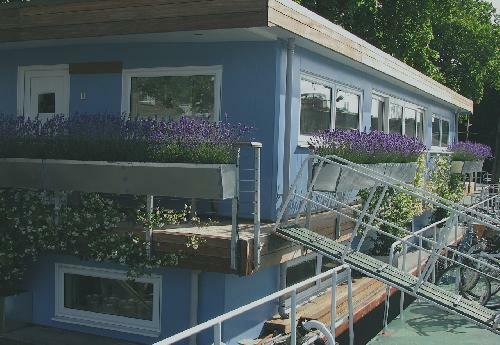 This houseboat moored in Chelsea is enhanced with plants in galvanised metal planters. Privacy is an issue, as most people are curious about these boats docking in the shores of the Thames: the tall lavender hedge helps to part-cover the windows but still lets in light. The shadier parts are planted with evergreen climbing jasmine (Trachelospermum jasminoides), which also help to cover part of the blue wall and give a lovely scent to the air when the white flowers are in bloom. The riverside setting combines well with the Mediterranean planting theme to give a truly continental impression.